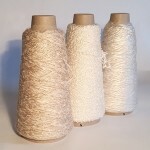 50g cones of gorgeous undyed fancy pure silks in a range of textures and thicknesses. 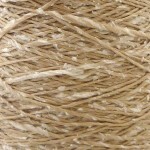 Choose from: Thai - a tussah silk meaning it has the natural golden colour created by the silk worms munching on oak leaves. It has lots of slubs and nepps and a lovely natural lustre throughout its uneven texture. 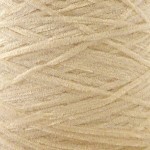 Bliss - a lopi style yarn with a light twist and a highly glossy surface. 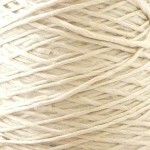 It is a mulberry silk meaning it has quite a white/ivory colouration. Bliss has a slight slub meaning it's not quite the same thickness throughout, but this is gentle and adds to the character of the yarn. 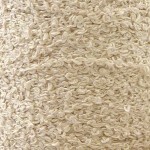 Boudoir - a loop yarn full of character and texture. The loops are round, even and gleaming and create a glossy surface that light bounces off from all angles. Divine - a tussah silk chenille yarn which has a natural golden cast due to the oak leaves the silk worms munched away on, but has been bleached to soften this colouring to a paler hue. Due to the nature of chenille there is less reflection than a traditionally "spun" yarn, but it still has a lovely natural lustre to create a velvety texture.